What a difference a month makes! In case you missed it, here's what this pot looked like last month. Started in the basement under lights, the first nasturtiums were spindly and sad. During the past month, three of the original sad nasties expired. The three that remain have sprouted more leaves, and look much better. The seedlings started after the pot went outdoors are much happier and healthier-looking, and even cover the spindliness of the lower stems of the older ones. Having never grown nasturtiums before, starting them in the basement was a learning experience. What not to do: Don't try to get a jump on the season with nasturtium seeds by starting them indoors. Even my expensive, high-powered sodium grow light doesn't provide the right light to produce sturdy, happy nastie seedlings. While adequate for stocky veggie seedlings, and overwintering tropical and tender plants grow and bloom happily under the light, nasturtium seedlings seem to need natural, full-spectrum sunlight for healthy growth. Now that that's settled, I'm enjoying the cute round leaves on the happy nasties, and looking forward to buds and blooms. Though not as showy as Digitalis purpurea or many other (mostly biennial) foxgloves, Digitalis grandiflora is longer-lived. This one has been in our shade garden for five years. It's lovely in a naturalistic setting, looks great with both hot and cool colors, and thrives here in dry shade. While not native, it's well-behaved in our garden and attractive to pollinators, including hummingbirds. In spite of its delicate appearance, it's a tough plant, unbothered by pests or diseases. Though it's never seeded itself in our garden, other gardeners have reported it to self-seed easily, almost invasively. Digitalis grandiflora is one of the longest-lived perennial digitalis. Still, ours is old enough that one spring it may not come back. The last of three original plants, (I killed the other two trying to divide them,) last year I saved its seeds, shared some, and started a few in the basement over the summer. The seeds sprouted readily - 100% of them germinated. They were planted out last fall, and will probably bloom for the first time next spring. Have you grown Digitalis grandiflora? If so what's your experience with it? This year I'll be saving seeds again, some for Monica, and am happy to share seeds if you'd like to try this lovely plant in your garden. The problem: Silver maples are messy trees, dropping buds and seeds, invading lawns and gardens with hundreds (thousands?) of seedlings every spring, and dropping twigs and branches all year long. The contents of this 30-gallon trash can above, and this pile of twigs and branches below, accumulated over the winter. The Lawn Man used to pile them in the garden before it was a garden, and we've continued that practice until last year when they were kept here, next to the garage. Our vacuum shredder has been used to turn branches into mulch, but with its one-inch hopper, the job was long and tedious, and hardly seemed worth the time and effort. It was tempting to just bag this stuff and send it to the municipal composting facility. I was dreading the shredding, but didn't want to send free potential mulch into the waste stream either. I was thrilled earlier this spring when Troy-Bilt contacted me, offering the opportunity to choose, free-of-charge, almost anything I wanted from their catalog. Their only request was that after testing my choice, I would review the product here, providing my honest opinion, good or bad, of how the product worked for me. After reading other bloggers' reviews, and Troy-Bilt's website reviews of most of their products and after consulting with the Lawn Man, this red beauty was selected. I hoped it would be the solution to the current mess on the side of our garage, and to future stick piles generated by a never-ending supply of falling maple twigs and branches. It arrived earlier this week. A large crate was unloaded from the back of a semi with a lift gate, and the driver graciously wheeled it into our garage with our hand truck, immediately resolving my concern about whether I'd be able to get it from the truck to our garage in what was expected to be a curbside delivery. This machine weighs in at 200 pounds. When I asked about its size to make sure it would easily fit in our already-packed garage, its weight was more than a little intimidating. Aside from getting it from the curbside to the garage on a weekday when the Lawn Man was at work, I was sure he could handle its size and weight, but I wanted to be able to use it too. Midway through the job, over the sound of the machine I heard what sounded like a small metal thing hit something. I wasn't sure if something had fallen on the ground, or in one of the hoppers. My first thought was that one of the nuts on the inside of the hopper had come loose and fallen in. To prevent potential damage to the machine or kickback of whatever had fallen, I shut off the machine, inspected the inside of the hoppers and the sidewalk around it looking for a nut, bolt, or small piece of metal. Eventually I did find a bolt on the sidewalk, but couldn't find where it had come from. I didn't see any missing from the machine. Satisfied that maybe it was an extra one, I attempted to re-start the machine, but the pull cord wouldn't budge. "Uh oh," I thought, "I broke it!" I went back inside to consult the manual, and determined I probably needed to unjam the reduction chamber, where the shredder and chipper blades are housed. I followed the instructions for disconnecting the spark plug wire and making sure the machine was on the 'off' setting. Since I'd stopped the machine abruptly, there were still some small twigs engaged in the blades in the middle of being shredded, and I realized that was probably why the starter rope wouldn't budge. I was kind of nervous putting my hands near the blades even though I followed the safety instructions to the letter, and I did have some difficulty reaching into the tight space allowed. But finally I did clear the blades, returned the chute deflector housing into the operating position, reconnected the spark plug wire, and restarted the machine, quickly completing my task. Later, when I was showing off the machine to my husband the Lawn Man, he immediately noticed a bolt was missing from the pin that holds the chute deflector on the machine housing. Since it fell off during the first time the machine was operated, it may not have been secured tightly enough when the machine was assembled at the factory. I'm glad it didn't cause any problems other than the jam that occurred when I abruptly shut off the machine. Once all the branches were shredded, I unfastened the collection bag, dragged it back to this small corner bed in our back yard, and spread finely, evenly-shredded mulch a couple of inches thick over an already-existing layer of leaf mulch, where it will decompose and feed the soil, keep weeds and maple seedlings to a minimum, and reduce evaporation, minimizing watering. Aside from the interruption and frustration of a loose bolt and the ensuing jam, the first use of our new Troy-Bilt Chipper Shredder was a resounding success. What would previously have been at least a two-hour task was done in less than 30 minutes. I'm pleased and impressed with our new chipper shredder, and look forward to using it again on the next inevitable pile of maple twigs and branches, and other lawn and garden debris that might otherwise end up in yard waste bags. Thank you Troy-Bilt! Update 3.19.11: Since writing this review I've used the machine two more times - once last fall, and again early this week. It started with no problems, ran great, didn't jam up at all, and made very nice, fine mulch. When I used it early this week, I shredded leaves, and all the branches that accumulated over the winter. The shredded leaves were used on one of our little vegetable beds. The Chipper Shredder does a wonderful job on the leaves, which make great mulch for both vegetable and ornamental beds. I filled the collection bag twice with all the branches, and was able to refresh the mulch on the bed pictured above in this post. The mulch turns out fine and even in size. LOVE our Troy-Bilt Chipper Shredder! The last couple of years, early May has been rainy, dreary, and chilly. This year is no exception. Although parts of the Chicago area have seen frost this month, there has been no frost or freeze in our south suburban garden since late March or early April. To be safe though, most of our tender and tropical plants, and warm-season veggie seedlings are waiting in the basement 'greenhouse' for another week or two. that self-seeded in a few pots in the basement over the winter, and dragon wing begonias that overwintered down there. Celandine poppies are still blooming too. New garden transplants and divisions, and direct-sown cool season veggies are thriving with the rain and cool temperatures. Warmer temperatures and sunshine will return. Keeping up with clients at this busy time with all the rain we've had recently can be challenging. Still, I'm grateful we haven't been impacted by flooding or other severe weather conditions as other areas of the country have been. In the meantime I enjoy catching up with errands and indoor activities on days when rain interferes with gardening plans. What's blooming in your garden this month? To see more blooms from gardeners everywhere, please visit Carol at May Dreams Gardens. At the end of each day, the sun sets on us all leaving behind bright color and the feeling of serenity. Meg left us with that same sense of peace and the reminder to see life in all its beauty. Meg's legacy of love and light will remain as an inspiration for each of us to seek creativity and meaning in our lives. How blessed I feel to have had such a singular friend who makes saying goodbye so hard. My dear friend Meg, there is no poison ivy in heaven, and wasps don't sting. The garden up there will be even more beautiful than ever before with you there to tend it. Last year a number of columbines were added to our garden - a few red and yellow Aquilegia canadensis included in a native plants order from Possibility Place, Colorado blue Aquilegia caerulea, Aquilegia chrysantha hinckleyana 'Texas Gold' started from seeds received at Spring Fling - thank you Renee and Pam - and three (unknown varieties) self-sown seedlings culled from a client's garden. I have no memory of planting this pretty columbine. Only the seedlings from the client's garden bloomed last spring. The rest were planted later, some not until fall. This pink and white one was by far the largest and most vigorous of all, and was inexplicably the only one unaffected by leaf miners. All summer I thought this plant was one of the native red and yellow Aguilegia canadensis - in fact I was sure of it, and wondered how it managed to grow so large when the rest of the columbines were similarly-sized and much smaller. Columbines are known to self-sow easily, and to be fairly promiscuous in their cross-pollinating habits. I supposed it's possible this one actually is one of the ones that had been labeled canadensis as I remember, and came from a canadensis parent that was pollinated by another columbine. Wherever it came from, it's really lovely, and as you can see, it's blooming like crazy - a very nice surprise in a garden that never fails to surprise and delight me. With no frost or freezing temperatures here since early April and none in the forecast for the next ten days, I put these sad-looking, leggy "Spitfire" climbing nasturtiums outside this weekend. It makes me wonder how well nasturtiums will do even in a sunnier spot in our mostly-shady garden, since the basement light that grows beautiful veggie seedlings did such a poor job for these pathetic-looking plants. I hope they'll be happier outside, but for extra insurance I planted several more seeds in the pot. If the new ones sprout and are sturdier, and these don't look alot better by then, they're going into the compost! Never having grown nasturtiums before, and not knowing what climbing nasturtium seedlings are supposed to look like, I wasn't sure if these were typical of young nasturtiums. But after seeing Diane's winter-sown nasturtium seedlings, I can see that mine aren't quite right. I love experimenting in the garden, especially when my experiments turn out well. Frankly, I'm relieved that they're not supposed to look like this, and hopefully the second batch will be much nicer. In the meantime, I've resolved to avoid starting nasturtium seeds in the basement in the future! Last weekend while K, her new daughter, and I attended a wild foods/medicinal plants seminar, Monarda fistulosa was serendipitously announced as the winner of this year's One Seed Chicago votes. Wikipedia says Several bee balm species (Monarda fistulosa and Monarda didyma) have a long history of use as medicinal plants by many Native Americans. . . who recognized the strong antiseptic action of these plants, and used poultices of the plant for skin infections and minor wounds. A tea made from the plant was used to treat mouth and throat infections, and is the source of the antiseptic Thymol, the primary active ingredient in modern commercial mouthwash formulas. 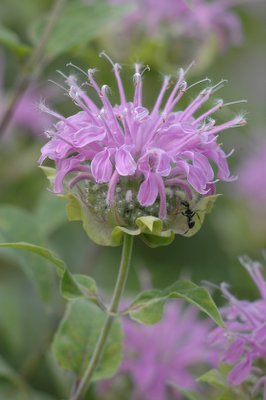 The Winnebago tribe used a tea made from bee Balm as a general stimulant. Bee balm was also used as a carminative herb by Native Americans to treat excessive flatulence. An infusion of crushed Monarda leaves in boiling water has been known to treat headaches and fevers. Although somewhat bitter, due to the thymol content in the plants leaves and buds, the plant tastes like a mix of spearmint and peppermint with oregano, to which it is closely related. Bee balm was traditionally used by Native Americans as a seasoning for wild game, particularly birds. The plants are widespread across North America and can be found in moist meadows, hillsides, and forest clearings up to 5,000 feet in elevation. While I voted for nodding onion, One Seed Chicago provides compelling reasons to be happy bee balm is the winner: "The past few years have seen an interest in the health of insect pollinators as a sign of a breakdown in our agricultural systems of production," says Michael Thompson, Farm Manager of the Chicago Honey Co-op. "Providing habitats with nectar forage for pollinators is a positive way to help with the decline in pollinating bees and other invertebrates." "Native plants attract native birds and insects and help to increase biodiversity in your garden," says Jennifer Davit, Director and Horticulturalist at the Lurie Garden at Millennium Park. "Our native plant friends are more adapted to their local surroundings and can handle the Chicago area's fluctuations in climate and weather." 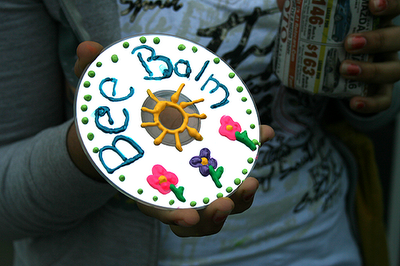 It's not too late for Chicago-area teachers and residents to request a free packet of bee balm seeds. Please consider participating with us in this community effort and help our native bees by planting this pretty, beneficial plant in your own home and school gardens. For more information and to request seeds, please visit One Seed Chicago.